The MSP reached the shores of South America through the arrival of Fr Faustino Pinili MSP and Fr Jaime Lalaguna MSP in the Diocese of Georgetown. The two missionaries arrived in Georgetown, Guyana on June 17, 2003. 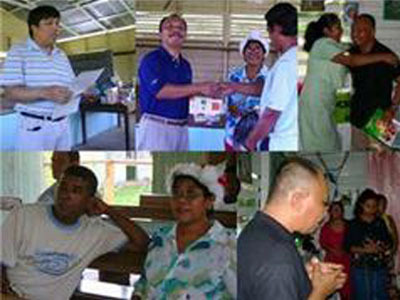 On August 1, 2003, Fr Pinili was installed as Parish Priest of the Our Lady of the Ascension in East Berbice, and was designated as chaplain of the Missionary Sisters of Charity. Meanwhile, Fr Lalaguna was the Parochial Vicar of that same parish, and the same time, he served as the Parish Priest of the Holy Guardian Angels in West Berbice. When his term ended, Fr Pinili came back home for good. At that time, Fr Lalaguna was transferred to a mission in Hosororo, near the border of Venezuela. Then Fr Lalaguna was teamed up with Fr Edwin Beley, an MSP Associate Member from the Diocese of Cabanatuan. When Fr Beley finished his conract in 2008, another Associate Member replaced him. He is Fr Allan Chabit from the Archdiocese of Cagayan de oro. At present, there are two MSP priests working in Guyana: Fr Jaime Lalaguna and Fr Jose Pepito Estaniel.